So I realized recently that I had reviewed Alice in Wonderland shortly after starting this blog, but I hadn’t done Through the Looking Glass yet. So, I decided it was about time I fixed that! I read this book ages ago and then I read it again for school a couple years ago. I absolutely loved it, how can you not? It’s got music and poems and crazy characters. However, I can also admit that this one left me significantly more confused than Alice did. I’m not sure if it was because I read it for school or if it was because it was actually more confusing than the last. I’m thinking both. 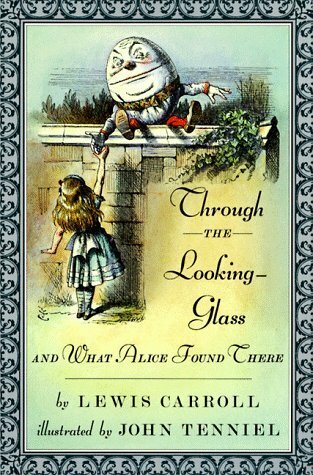 Through the Looking Glass follows Alice as she travels through a mirror to an alternate world. Just like in Alice in Wonderland, Alice encounters many strange happenings in this new reality. She meets Tweedledum and Tweedledee, encounters the Mad Hatter and the March Hare for the second time, and also meets Humpty Dumpty. She meets all of these wacky characters while crossing various brooks to reach new parts of the world. Its essentially a giant game of chess in which Alice travels through various parts of the world and when she reaches the end she’ll become queen. As someone who loves chess, I thoroughly enjoyed this part of the book. However, my favourite part of the book was when Alice reads the “Jabberwocky” poem. All throughout the book, various characters give Alice their interpretations of the poem, but no matter what it is, Alice still never fully gets it. Though this doesn’t stop it from being brilliant. “Jabberywocky” doesn’t really make much sense, which is sort of the point as it’s considered a nonsense poem. But despite it not making sense I really enjoy reading it. Its a great poem and is really fun to read out loud. You can find a link to the full poem below. This really is a great book with a lot of great aspects, though I must admit that I enjoyed Alice in Wonderland more. There were definitely certain aspects of this book that I enjoyed, like meeting Tweedledum and Tweedledee and the “Jabberywocky” poem, however I enjoyed the story of Alice in Wonderland more. Have you read Through the Looking Glass? What did you think? Did you prefer Alice in Wonderland or Through the Looking Glass?